It’s time to prune the roses again. Some of them have indeed lost all of their leaves, with no sign of new buds. A few plants, however, continue to defy the season. 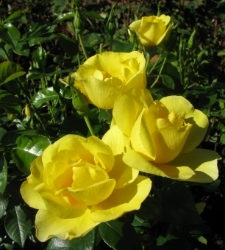 One in particular, a yellow rose named Serendipity, keeps reaching skyward with glossy leaves, big buds and bright blooms. It was the same last year: I felt guilty cutting the stems right back when it was still proudly putting on a show. It’s tempting to leave it alone; see how high it’ll grow. But I know that if I don’t trim it, I’m denying it the chance to grow vigorously next year. Left alone until the next season, the old wood’s growth would slow and become spindly, with perhaps half as many flowers. I’d get to keep this year’s shape, but lose the potential vibrancy of unknown beauty. Here’s where the metaphor kicks in. Sometimes we keep living the same life because it looks pretty good on the outside. But maybe on the inside we’re turning into old wood. We get a bit too comfortable... we move past satisfied. Perhaps we once had a dream that was long since stifled. If we don’t stop to think about it, we assume everything’s okay. But maybe we’re not living up to our full potential. If we don’t step outside the box, we might never know who we’re truly meant to become. It’s like they say: if you keep doing what you’ve always done, you’ll get what you’ve always got. It takes courage to chop off the dead wood and start again. If something new is nagging at you, don’t ignore it for fear of destroying a satisfactory pattern. Get out those pruning shears, then fertilise your ideas. It might take a while, but the chances are that they’ll bloom into something beautiful. wow...awesomeness. i love seeing through the mundane and just grabbing little nuggets of gold like this...and realising you so have to share that...because 'they' are in so much of a hurry, they're gonna miss it...you get it, sweet!